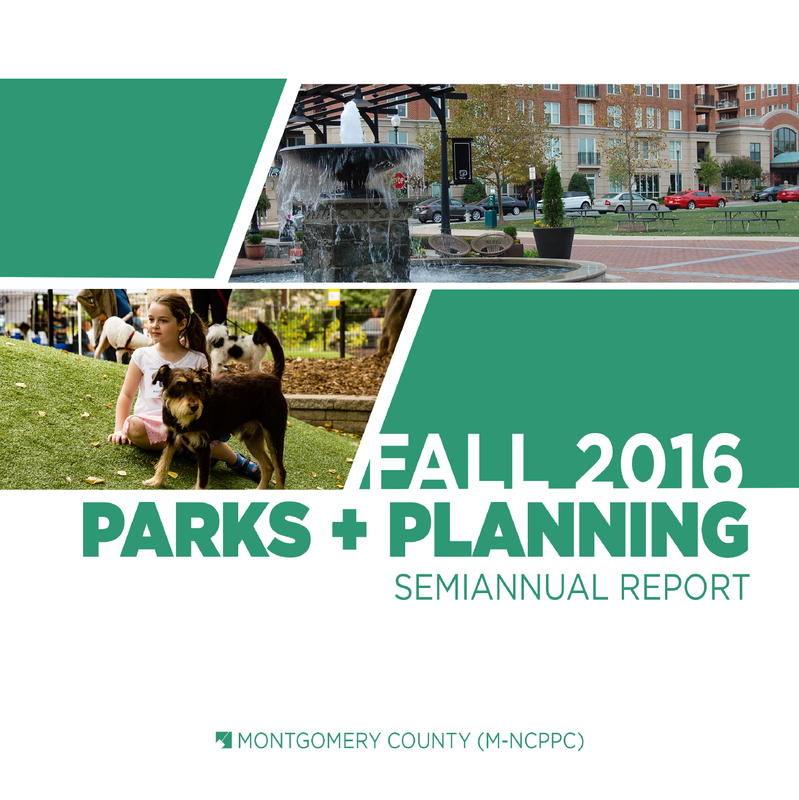 SILVER SPRING, MD – Montgomery Parks and the Montgomery Planning Departments, part of the Maryland-National Capital Park and Planning Commission, presented their Fall 2016 Semiannual Report to the Montgomery County Council on Tuesday, November 15, 2016. The report, available online, summarizes key projects and plans from the past six months and work that will be completed over the next six months and beyond. This progress report was submitted by Planning Board Chair Casey Anderson, who emphasized the need for effective planning strategies focused on community engagement, improved connectivity and public transit to attract residents and businesses to Montgomery County. Anderson cited Marriott International’s recent decision stay in the county and move to Bethesda as evidence of this successful approach. Planning Director Gwen Wright explained the three themes of the report – New Suburbanism, Engaging Communities and Strengthening Economic Competitiveness – as key to managing County growth. In addition to explaining recent plans and policies, Wright noted the increasing number of digital tools, such as interactive maps, to engage more community residents in planning efforts. She said developers submitted more preliminary plans in FY16 than in FY15 facilitated in part to by a more efficient process for reviewing and approving development projects. Director of Montgomery Parks Michael Riley explained the pivotal role that parks and amenities play in attracting visitors to the area and engaging people who live in the county. “Montgomery Parks’ facilities and events attract visitors from near and far to our parks and to the restaurants, shops, businesses and hotels that surround them. Whether visiting our award-winning Brookside Gardens, hosting a wedding or party at one of our event centers or hiking on one of our natural surface trails, people rely on parks to enhance the quality of their lives,” said Riley. – The County Council’s approval on November 15 of the updated Subdivision Staging Policy (formerly the Growth Policy) to will help ensure that new development is supported by adequate infrastructure. -The County Council’s approval of the Westbard Sector Plan in May. -Drafts of the Bethesda Downtown and Greater Lyttonsville Sector Plans that have been approved by the Planning Board and transmitted to the County Council for refinement. -Planning efforts for Rock Spring, White Flint 2, MARC Rail Communities of Boyds and Germantown, and Grosvenor-Strathmore Metro Area Minor Master Plan that are now underway. -The launch of the Master Plan Reality Check to provide a better understanding of why some past plans have been realized while others have not; this study will help improve future plans. -The Makeover Montgomery 3 conference held in May that drew more than 300 attendees. -The second annual Design Excellence Award competition, resulting in the October 2016 design celebration to honor the Silver Spring Library with the top prize and the award of five jury citations. -Opening of several new parks, including North Four Corners Local Park, Woodlawn Manor Visitor Center and Ellsworth Dog Park. -Award-winning projects, including recognition of Evans Parkway Neighborhood Park, East Norbeck Local Park, Woodlawn Visitor Center and Darby Store. -Fundraising success by the Montgomery Parks Foundation, enabling the purchase of a climbing wall and a mobile pump track to use at park events and facilities. -Extensive accessibility improvements to enhance parks, facilities, programs and services. -Numerous successful pop-up events in parks to engage people in the community. Events included Climb-A-Tree, Bollywood Dancing and Tai Chi, among other activities.